Tuberous begonias are colorful, tropical flowering plants that lend a splash of color to the shade garden. Versatile plants, tuberous begonias can be grown as bedding accents or in containers and hanging pots. As the name implies, tuberous begonias grow from a tuber that must be protected from winter cold and moisture. The plant will naturally go dormant but can be helped along in warmer regions by gradually allowing the soil to dry out, beginning in August. 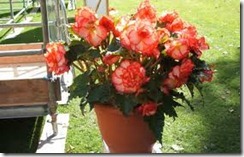 Withhold water and fertilizer from the tuberous begonia beginning in August. This will cause the foliage to die back and send the tuber into dormancy. Bring the potted tuberous begonia indoors after the first frost and place it in a cool, dry room. In warm regions, wait until the foliage has completely turned brown, usually in October or November, and then bring the pot indoors. Do not cut the foliage from the tuber. Dig up the tuber and set it, with foliage intact, in an area that remains dry. Allow the plant to remain there for 3 to 5 days, until it is completely dry. Remove the foliage from the tuberous begonias and brush the soil from the tubers. Place each tuber in its own paper bag. Place all of the bags in a box in a dark area that remains between 50 and 55 degrees F. Check the tubers periodically over the winter for pests and rot.